Imagine having your friends over for a screening of a just-released movie, in your own private movie theater. No lines, no tickets, no crowds. This is the dream! We love working with our clients to bring their dream theaters to life. We work not only on creating full-featured home cinematic experiences and dedicated theater rooms, but also on multi-purpose media rooms that combine living with entertainment. What makes the most sense for you will depend on your needs, your anticipated use, and your budget. Our design experts would love to talk with you, look at your space and make a recommendation. What are you looking for in a theater? How much space do you have, and how closely do you want to replicate a theater-going experience? Our designers will ask these and a series of other questions to determine what recommendation to make. Your needs and budget will drive all the decisions we make, from design to selection of equipment. We love working with clients to squeeze the best possible experience out of their budget, and when possible, meeting and even exceeding the comfort and quality of a cinema experience. Talk to us about professional, cinema-quality projects and ultra-comfortable theater furniture. We look forward to working with you and determining the best way to bring the cinema to your home! Domes AV is a Savant and Control4 dealer serving Virginia Beach, Chesapeake, Norfolk, Newport News, the Outer Banks and more. 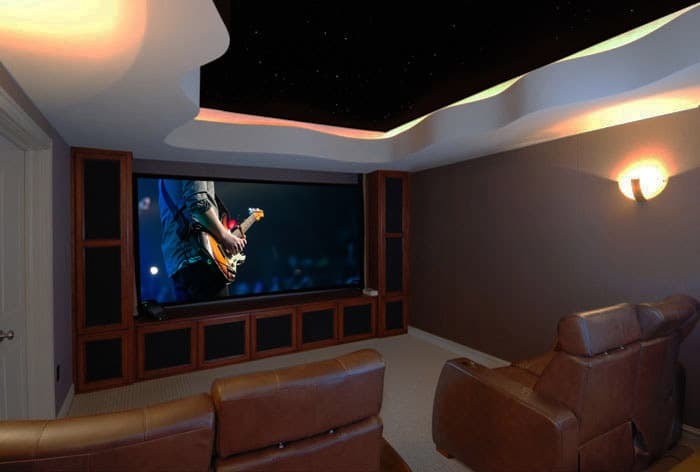 Are you looking to add a home theater or media room to your new or existing home? Clients throughout Virginia and North Carolina trust us to deliver quality work that enhances their lives. Call for a free consultation today to see how we can help your next project!